Last summer when I traveled to L.A., I was able to have lunch with friend Justina Blakeney, who I consider one of the most brilliant creative minds in the industry. She has the golden touch to ingenuity and original design. You may remember the creative profile I shared on her last year. When I first heard about her book, The New Bohemians, I circled my calendar and made a big note in capitalized letters, DON’T MISS!. Not even joking, and I have been anxiously awaiting it’s launch ever since. So happy to be a stop on the Book Tour today. I devoured every page of the book (and I am not kidding when I say it is one of my top 3 prized books I currently own). 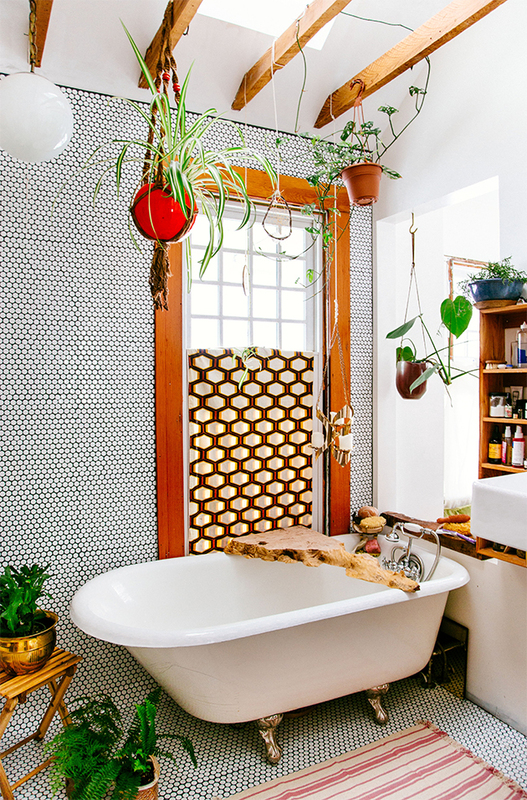 Maybe because it speaks to my bohemian eclectic loving heart and makes it actually seem tangible. Now while the book is loaded with home tours, and dreamy images of all the home details, there are also instructions for easy and clever DIY’s for your home. 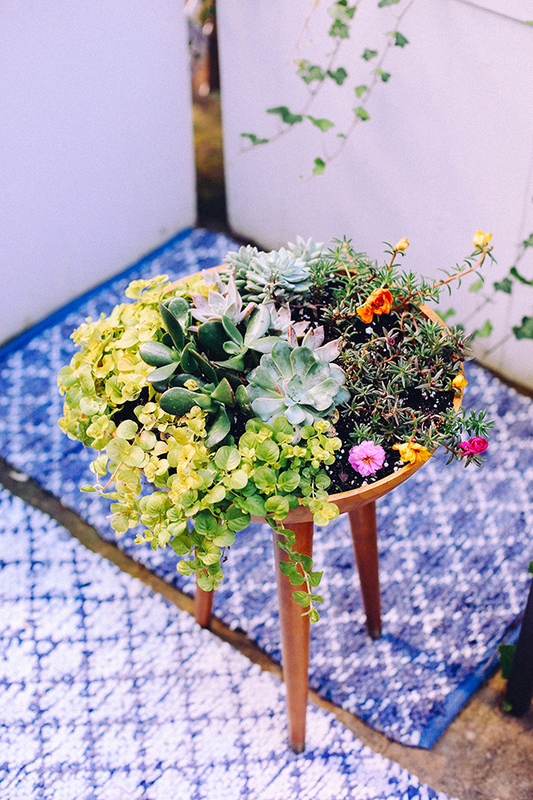 I tried out the DIY Tripod Planter…. I filled the planter with mainly succulents, portulaca, and creeping Jenny. You can find the very thorough and helpful instructions to assemble in the book. I purchased the tapered wooden legs from the vintage section on etsy, and used my old wooden salad bowl. 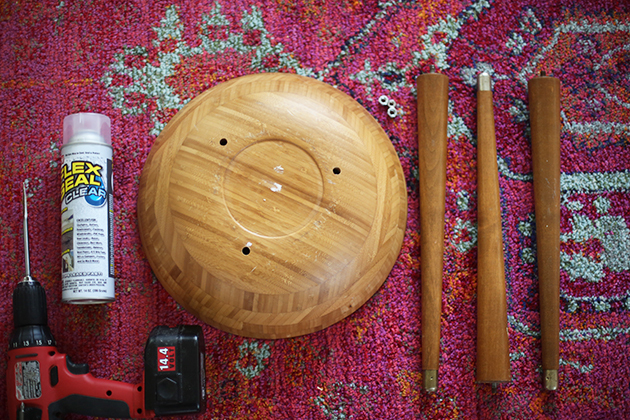 Tip: Spray the inside of the bowl with a weatherproof varnish so it lasts a little longer despite water use. We drilled a hold in the middle bottom as well for draining. Couldn’t get over how easy it was, and it has been such a nice addition to our back patio (if I can keep Max out of it for a few weeks;)). One of my favorite rooms in the book^^. Just a teaser. I’d say it doesn’t even matter if you are need of home decor, textile, DIY, lifestyle, or color ideas. 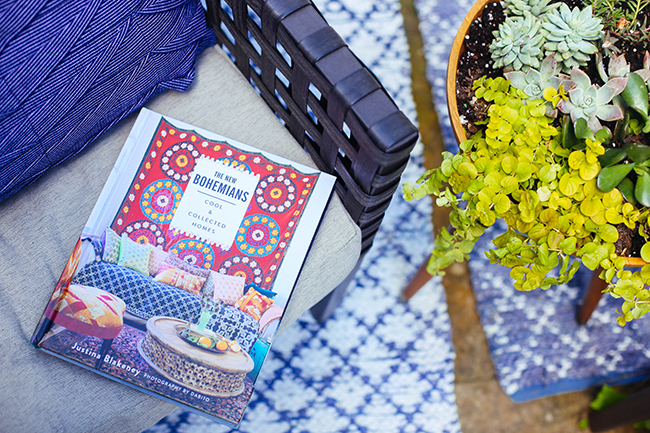 This book is worth it for the visual eye candy;) Snag a copy here. I love that planter!! How pretty! Hello! I’m glad I found your blog. This post is amazing. I don’t have The New Bohemian book yet, but I definitely want to get it now. I absolutely love mid-century modern and if this book has this DIY, I would really like to make it. Do the instructions call for a salad bowl? That is genius! Thanks for this post and I really like your blog. I’m definitely going to follow. 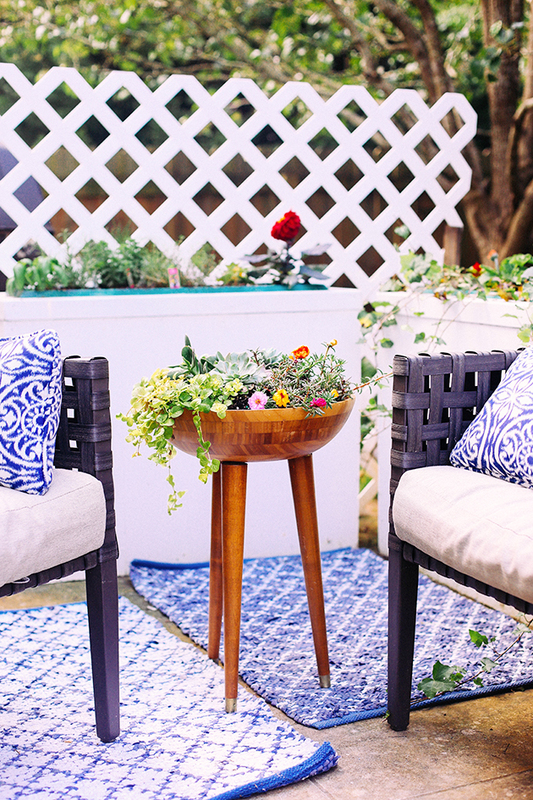 Your decor is so airy , open and fresh .The wooden planter adds to the charm,but will have to make do with a square or rectangular one for shape.Will look forward to more of your lovely ideas. 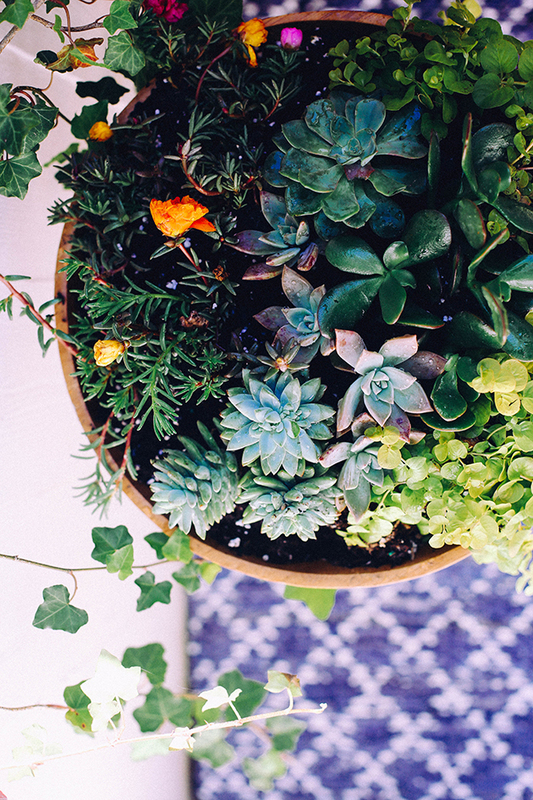 I really like how you mentioned that, “I filled the planter with mainly succulents, portulaca, and creeping Jenny.” This is great stuff so you planter doesn’t stink up over time. My wife loves planters and I wanted to make her one for the porch. 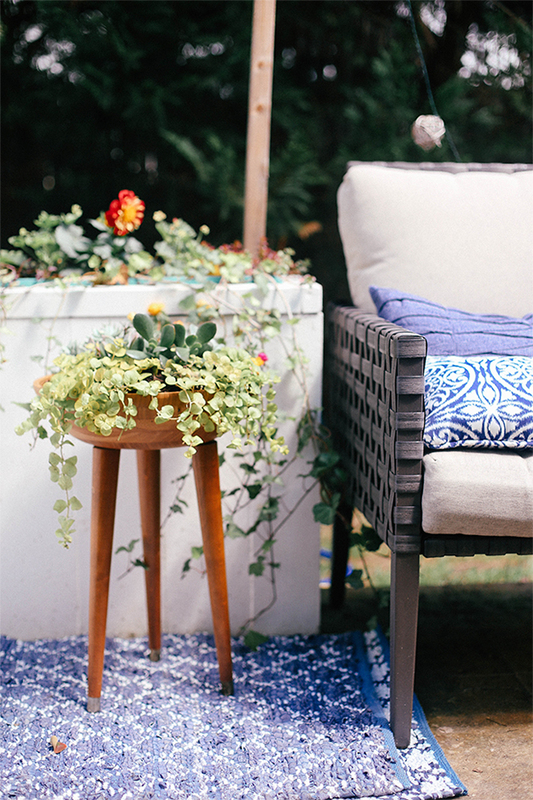 Thanks for sharing because I really like the stool idea of a planter.